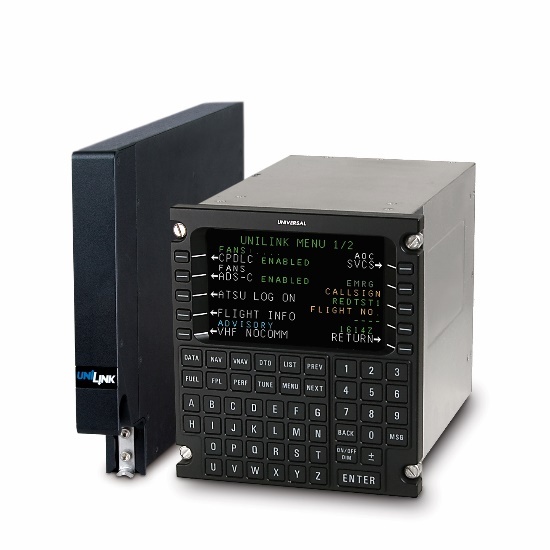 LAS VEGAS, NV – Universal Avionics Authorized Dealer, Chicago Jet Group, is adding the new Aeronautical Telecommunications Network Baseline 1 (ATN B1) Module for the UniLink UL-800/801 Communications Management Unit to all of their existing FAA and EASA approved FANS/CPDLC STC’s. This will allow customers to upgrade for ATN B1 CPDLC and Context Management functions required for the 05 February 2020 European mandate, formerly known as Link 2000+. The UniLink UL-800/801 CMU can be installed on a wide range of platforms, even those with a third party Flight Management System (FMS). Unlike other solutions, the UniLink UL-801 has the FANS and ATN B1 software built in, along with an internal VDL Mode 2 radio. For more information, visit Universal Avionics booth N2821 during NBAA-BACE 2017 while exhibit halls are open. About Chicago Jet Group Chicago Chicago Jet Group operates an FAA Class 4 Part 145 Repair Station with EASA approval, focusing on the installation and certification of NextGen avionics technology in Part 25 aircraft, in addition to providing airframe and engine maintenance. Contact Chicago Jet Group at www.chicagojetgroup.com; Visit us at Booth N3132 during NBAA in Las Vegas.